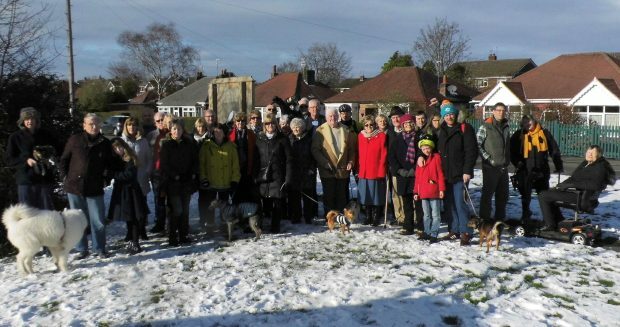 A group of more than thirty residents of Penningtons Lane and the surrounding areas gathered together recently to protest to the proposal to site a 15m mobile telephone mast and several large cabinets housing equipment, on the attractive green at the junction with Congleton Road. 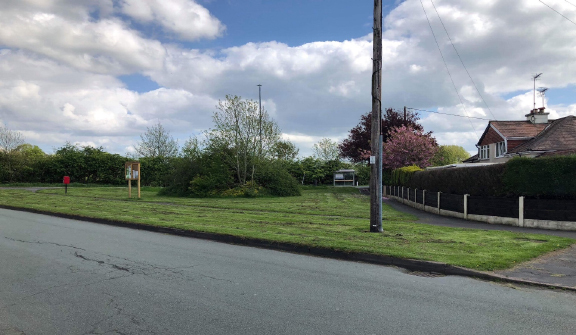 More than 120 people have already signed a petition objecting to the proposal; a number of meetings have been held with local residents, the Ward Councillor and Gawsworth Parish Council. The Harlequin Group who are acting on behalf of EE Limited are prepared to consider other sites but this appears to have been blocked by Cheshire East Council. Colin Garlick, on behalf ofthe residents said: “we are objecting to the siting of the huge telephone mast, which is being moved from a commercial site on Moss Lane to a residential area. This will have such an intrusive impact on the appearance of the green and destroy the character of the area”. It seems that Cheshire East Council is not even prepared to consider alternative and more appropriate sites”. Councillor Laura Jeuda who has supported the residents since the campaign began in April last year said: “I am concerned that the views of residents, including those who have lived on Penningtons Lane for many years appear to have been ignored”. To site such equipment, which will be considerable in size and bulk, on an attractive piece of green land in a residential area seems grossly unfair. The proposal has already caused some of the older residents’ considerable stress and anxiety”. In objecting to this planning application the first point that we would like to make in relation to the Planning Application by EE Limited (formerly Orange to PCS Ltd) to replace the existing 20m mobile phone mast currently housed on the Henshaws Envirocare Ltd land on Moss Lane and replace it with a 15m mobile mast and associated equipment on the grass verge at corner of Penningtons Lane/Congleton Road is that the current structure was originally sited on a “commercial site” and this proposal takes it from a “commercial site” and places it in a “residential area”. If it has to be transferred it should be housed on an alternative “commercial site” or a suitable none “residential site”. It is understood that Henshaws Envirocare Ltd no longer wants the mobile mast on their site due to the impending sale of the site to Barratt Homes for a housing development. Understandably, Barratt Homes may not want a mobile phone mast and associated equipment sited in a new residential development area. Barratt Homes have stated they cannot consider a lease with EE Limited due to title issues they don’t own the title of the land yet and a lease cannot be progressed with them. This further highlights that this equipment should be not be sited in a “residential area” and an alternative “commercial site” should be found. Our home is on the corner of Sussex Avenue and we have two bedrooms, a dining room, a conservatory and a garden that have views of the grass verge where this proposed mast is to be sited and we really do object to potentially having this monstrosity spoiling the view from our property. There are a number of properties that are closer to the green than ours and the residents of these properties are more senior than ourselves and have been distressed by this proposal since it was first raised in April 2018. Our property and those immediately surrounding the green are bungalows/dormer bungalows and this mast will clearly dwarf these properties. We would question some of the pre-planning consultation that has taken place between the Developers representatives and the Cheshire East Planning Department who offer a pre-planning service to Developers. The original proposal was planning to site this mast and equipment on the Penningtons Lane side of the green, the planning Department suggested to EE Ltd that their proposal was for the mast and equipment should be sited on the Congleton Road side of the green as “it would better assimilate to its surroundings”. We have a number of thoughts in response to this suggestion. Firstly the Planning department felt there was a clear visual issue with this proposal, otherwise why suggest it is moved from one side of the green to the other, a distance of approximately only 10 meters. To suggest that this equipment assimilates to its surroundings is in our opinion extreme exaggeration. Below we show a photograph of a mobile phone mast and associated equipment similar to that proposed for the Penningtons Lane green, this mast is sited on Earlsway on the Weston Estate and despite the three storey shops/flats we would strongly argue that this mast in no way assimilates to its surroundings. Above: Photograph of a mobile phone mast and associated equipment set against a back drop of two storey buildings on Earlsway, Weston Estate, Macclesfield. “The site is located on a wide publicly maintained grass verge and will utilise existing tree/vegetation which measures at 5-8 metres in height to act as a natural virtual context for the proposed development”. The proposed mast is 15 metres in height, which is up to three times higher than the bushes and will clearly stick out well above this vegetation. “The site is located Street lighting columns measure 7-8 metres in height and provide a visual/vertical context for the proposed structure”. The proposed structure will therefore be approximately double the size of existing street furniture and will clearly dominate the site. “Will not overly appear overly dominant or prominent”. An interesting choice of words and again an exaggeration to state that the mast and equipment will not be prominent and will not dominate the site, the absolute complete opposite will be the case. A simple comparison of the existing street light at a height of 7-8 metres is already double the height of the bushes and the mast will tower above the street lights. As you will see from the photograph above the verge is the gateway to this part of the village and many people use this gateway on a daily basis, people use it to go to and from work and to take the children to and from school but it is also a popular route for access to the fields on Congleton Road where many people take their dog for a walk or go jogging. It is also surrounded by residential properties that are in character with the area. This site partly discarded because “the structure is likely to cause driver sightline issues when exiting Moss Lane Garage”. We would also like to make an objection to the proposed Penningtons Lane/Congleton Road site on the same grounds of road safety. The planning application highlights that Congleton Road is a main A road and one of the main exit routes from Macclesfield to the south. The mast itself along with the boxes / cabinets are large solid cabinets objects and may restrict the view of traffic turning into Penningtons Lane which could put pedestrians posting letters or crossing the road at risk. The mast and cabinets will certainly be in the eye line of traffic looking to exit Penningtons Lane and increase the risk of a road traffic accident. It should be noted that the Penningtons Lane junction on to Congleton Road is a GIVE WAY junction and not a STOP junction. Existing owner has given notice for existing lease to be terminated. These sites are likely to be sold to Barratts Homes for residential developments. As stated previously, understandably Barratts Homes would not want a mobile phone mast on a residential development but cannot commit as they don’t own the site. “This site is more visually intrusive than the proposed site due to the existing street infrastructure being of less height and not being on a main road”. Whilst Congleton Road is a main road Penningtons Lane is not. Also we would argue to say that to state that this site is more visually intrusive than the proposed site is a matter of opinion and in turn would also argue that this site is less visually intrusive than the proposed site. We would add that as this is a part residential site also, we would not wish this on the residents who would be affected if this site were used. To note that a site is “visually intrusive” and that one site is more “visually intrusive” than the other one, confirms that both sites are “visually intrusive”. We would argue that the Penningtons Lane/Congleton Road site is more visually sensitive than site 6 but this becomes subjective. WE WOULD VERY MUCH LIKE TO HIGHLIGHT HERE THAT BOTH SITES 5 and 6, REGARDLESS OF THE EXTENT OF BEING “VISUALLY INTRUSIVE” ARE DESCRIBED IN THE PROPOSAL TO BE “VISULLY INTRUSIVE”, AN ADMISSION THAT SHOULD BE NOTED AND LEAD BOARD/COMMITTEE MEMBERS TO CONCEED THAT NEITHER SITE 6 or THE PENNINGTONS LANE/CONGLETON ROAD SITE SHOULD BE A CONSIDERATION AND REJECT THE PROPOSAL. SITES 12 & 13 HAVE ALSO BEEN DISCARDED DUE TO BEING “VISUALLY INTRUSIVE” Clearly some sites have not been progressed due to them being “visually intrusive” the site at Penningtons Lane/Congleton Road should be discarded for the same reasons as this equipment will be intrusive and dominate the green. “The Council’s Asset Management Service were not willing to consider any sites on their land until other options had been exhausted”. We have deliberately left this site until last as we feel it could be a viable alternative option to site the mobile phone mast and associated equipment and it is an option that EE Ltd through their agents the Harlequin Group have looked to progress. Why should this site not be considered alongside other sites and why are the Council able to refuse to have this land only considered as a “last resort”. I would object to the photographs used in the planning application and whilst it states that they are for “illustration purposes only” we do believe that these photographs are misleading as they have all been taken some distance from the green and none of the photographs show the cabinets housing the equipment. In terms of the cabinets themselves, these types of cabinets are solid unwelcome objects that are an eyesore and litter the landscape. The arguments in favour of them is that they are painted to blend in with their surroundings, the reality is that as well as causing an obstruction to views they unfortunately attract graffiti, which would be particularly unsightly in this area. We have been opposing this proposal since April 2018 when we received a letter from the Harlequin Group advising us of the plan to relocate the mobile phone mast and associated equipment from the current site at Henshaws Envirocare Limited on Moss Lane to the grass verge at Penningtons Lane/Congleton Road. We have a great deal of time in the last nine months discussing the proposal with other residents. We have attended Parish Council Meetings, engaged with Parish and Ward Councillors, written to and met with our MP. We have knocked on doors to ask local residents to sign a petition, walked the streets delivering leaflets campaigning against the proposal. As residents we have also engaged in a Community Consultation with the Parish Council and representatives of the Harlequin Group at a special meeting held in October 2018 at Gawsworth Methodist Church Hall. At that meeting residents, councillors and Harlequin representatives identified an alternative site in the Congleton Road Playing Fields (Site 4) and it was agreed by all parties that this site could be a viable alternative site acceptable to everyone. The Harlequin Group agreed to pursue this as an alternative and made numerous requests to the Council’s Asset Management Services to conduct a survey of the Congleton Playing Fields site and eventually responded by stating that they would not be willing to consider this site or any sites on their land until other options had been exhausted. As Council Tax Payers of Cheshire East we feel entitled to ask that Council sites should be considered in an impartial manner and particularly if this helps to serve the residents and the community within the Cheshire East area. 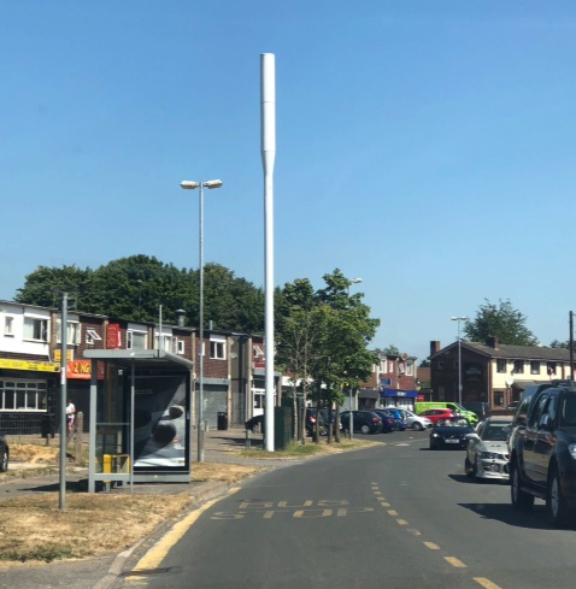 We would go as far as to say that the Council has a duty to the community that it serves to ensure that this mobile phone mast, which is currently situated on a “commercial site” is relocated to another “commercial site”. Cheshire East Planning Department have only written to 4 addressees in relation to this planning application. The Harlequin Group acting on behalf of EE Limited have only written 28 households but this proposal affects more people than this and this is confirmed with the petition that has been signed by more than 100 people and the many people that use the gateway on a daily basis. Given that this mast and equipment is currently located on a “commercial site” and the proposal is to move it to a residential site we would respectfully request that Strategic Planning Board/Planning Committee do not approve this application as it is a wholly inappropriate location to site such a monstrous mobile phone mast and associated equipment on Penningtons Lane green as, it will have such an intrusive impact on the appearance of the green, destroy the character of the area and will dominate what is a very attractive green space. ← Previous Story Need a brass band?